The first was triggered on Bellevarde at around 10:30am where 3 skiers got caught in a slide 120m long, 80 m wide, with the break measuring 80cm at the crown. 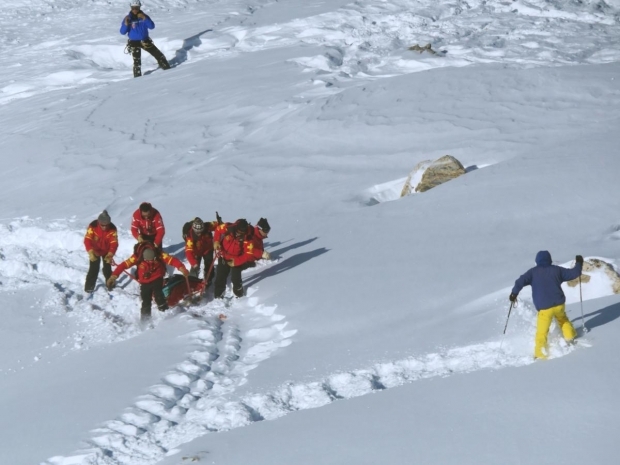 Thanks to the pisteurs arriving on the scene quickly, the first skier was recovered quickly but the second was buried 1.5m deep, and the third remained unconscious for 10 minutes. The second skier received CPR on site and was flown to Grenoble hospital. An hour later, a group of Spanish skiers triggered a slide above Santon. One of them was buried 1.5m under the snow. This slide measured 80m long, 30m wide with a 1m crown. 15 ski patrollers and 2 avalanche dogs were quickly on the scene and the 37 year old skier was found relatively quickly. Rescuers accompanied by a doctor tried to resuscitate him for over an hour he was pronounced dead. It is believed that he was not wearing a transceiver.